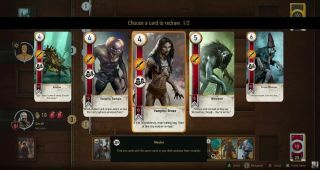 One of the big surprises to come out of The Witcher 3: Wild Hunt is the popularity of Gwent, the vaguely Hearthstone-like collectible card game that Geralt can play instead of pursuing his long-lost love and adoptive daughter. The rules are quite simple, as the man behind the table says, but it's got unexpected depth for a game-within-a-game, and so Rafal Jaki and Damien Monnier of CD Projekt have created a tutorial video explaining a few of the game's finer points. Gwent is a very abstracted simulation of a battlefield, with cards from four decks—Northern Kingdoms, Nilfgaard, the Scoia'tael, and Monsters—played on three ranks, for melee fighters, ranged fighters, and siege weapons. Special cards can affect the conditions on the battlefield, and thus the abilities of fighters; fog makes it impossible for archers to see what they're shooting at, for instance, while rain reduces the effectiveness of siege weapons. The video doesn't dig into the specific rules so much as basic strategies, such as why you should avoid having two vampire cards in your hand simultaneously. As such, it's clearly aimed at virtual Witchers who aren't entirely uninitiated in the game, but who also haven't sunk enough time into it to really have a good grasp of what they're doing. But it also shows off just how good the game looks in its own right, and without the intro and exeunt of Geralt and his new buddy, it would be easy to forget that this isn't a video of a stand-alone game. In fact, a stand-alone game with multiplayer support would be very cool. I have no doubt I'll play a lot of Gwent within The Witcher 3, but I imagine that I, and a lot of other folks, will want to keep on playing it long after the game is over, too. CD Projekt, are you listening?